Imagine with me, for a moment, that ten percent of the people you know are on a top-secret quest on behalf of humanity. When they receive their missions, they have no choice but to accept them. They go off to fight battles that take them out of the office and social commitments for hours, days, or weeks at a time, sometimes without warning. Sometimes, they’re tired from this other life, and it shows. For the most part, however, when they’re there for you, they are fully there, like Clark Kent is to Lois Lane when he’s not out being Superman. I have news for you: This is already true. At least ten percent of Americans, 33 million people,* are working day jobs while also taking on major battles on behalf of humanity. Their enemies, however, aren’t comic book villains. They’re diseases. Their bodies are walking laboratories, testing treatments and searching for cures. They may not have had a choice in the matter, but they have become warriors on the front lines of human health, spending their own time, energy, and money to fight chronic illnesses that have a way of striking at the most inconvenient moments. Let’s call their mission ‘immune resilience’ and refer to these quiet warriors as the “immunodiverse”. Similar to neurodiversity, immunodiversity represents a constellation of atypical system behavior. While neurodiversity describes atypical brain function, immunodiversity describes atypical body system behavior. I’m using “immuno” to represent all body systems that are functioning aytpically, whether that be the tissue of the uterus growing where it shouldn’t with Endometriosis or the defects of connective tissue that occur with Ehler-Danlos Syndrome or with any myriad of other conditions like Lyme Disease, Lupus, Multiple Sclerosis (MS), Postural Orthostatic Tachycardia Syndrome (POTS), Chronic Fatigue Syndrome (CFS), Arthritis, Hashimoto’s Disease, Crohn’s Disease, etc. According to the Centers for Disease Control, forty percent of Americans — or 133 million people — manage an ongoing, chronic condition. Of these, roughly 40 million Americans are limited in their usual activities, meaning they need and are entitled to accommodations. For some people, this condition is easily visible to others. They may be in a wheelchair, or wear assistive technology. 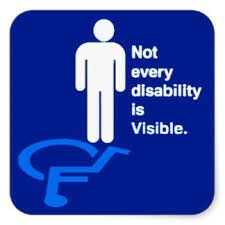 But you can’t always tell who has a chronic illness just by looking at them. According to the Centers for Disease Control, forty percent of Americans — or 133 million people — manage an on going, chronic condition. One of the differences with these chronic conditions is that, unlike using a wheelchair or glasses, you can’t usually tell who is affected just by looking. These people are “able-passing.” This means that we aren’t immediately perceived as disabled. In some ways, this is a privilege. It allows us to avoid the stigma of disability, but also can be difficult because it’s much harder to get necessary accommodations. That’s not the only thing that makes immunodiversity different from how disabilities are typically perceived. Many people assume disability is a permanent or irreversible condition. But, even the federal government defines “severe disability” as a condition lasts at least 12 months, never stipulating the permanence of the condition. The dominant narrative around disability is black or white: you use a wheelchair 24/7, or you walk. You are on government assistance full-time, or you work full-time. You are sick, or you are taking medication to permanently get better. This narrative is simply too flat. Reality doesn’t match this definition. Like all other human beings, we experience both sickness and health. And when we are healthy, we want to do more. I live in that grey space. I am immunodiverse. My immunodiversity is a battle with Epstein-Barr Virus, Lyme disease and its coinfections, Babesia and Relapsing Fever. These are conditions that attack my body’s immune system in complex ways, for which there is no known cure, and for which there is no clear treatment regimen to ease its impacts on my entire mind-body system. A tick bit me while I was leading a backpacking trip in Wisconsin in college in 2003. Those tiny creatures and I are still locked in a battle for my health. In 15 years, I have been to 45 doctors, spent more than $150,000 of my own money, and tried over 25 treatment protocols, all the while documenting my experiences so that our world can band together to more effectively fight diseases like mine. Image description: a pile of bill bottles, dropper bottles, prescription papers, on a beige rug with a weekly plastic medication organizer on top of the pile. 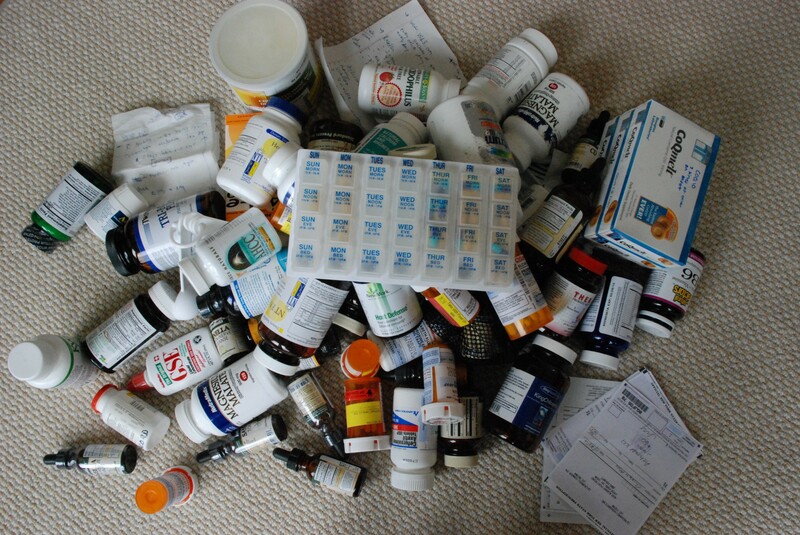 The author’s medications from a 6month period in 2007. Yet, like many immunodiverse people, most of the time I look wholly well from the outside. I’m a former collegiate athlete, tall, lean, and muscular. I am able-passing. Yet, underneath that, I’m usually managing symptoms, the severity of which can fluctuate wildly. This makes it difficult to predict and hard for people outside my body to understand. On a good day, friends describe me as “high energy.” On a mediocre day, I’m…“moody.” You’d never see me on truly bad day, because I don’t go out in public. I can’t. I live in my bedroom, making the occasional trip to the bathroom. I’ve used a wheelchair, but most of the time I can walk. I can only work part-time, yet I love my job as a lawyer. I am not cured, yet the severity of my symptoms have softened as a result of years of experimental treatments and attentive self-care. Most of the time, I do not look like I need accommodations. In fact, when I use a handicap parking spot, I often get the side-eye from people who think I am abusing the system, unaware that walking from that spot to the front door will cost most of the energy I have available for that day. This is the experience of millions of people in the United States: neither fully able nor completely disabled, but somewhere in between. In the next two years, by 2020, the number of people with chronic health conditions is projected to grow to ~157 million, with 81 million having multiple conditions. Meaning, there are a lot of immunodiverse people fighting invisible battles and that number is only growing. And, no matter how hard you try, anyone (even you!) can end up with a chronic illness. Indeed, some are hereditary, some appear later in life, and some are associated with an accident (like being bitten by a tick). Some severely limit your previous activities, such as a star athlete who develops ALS and now uses a wheelchair. Some people continue with life near full speed, like celebrities Selena Gomez (Lupus), Julianne Hough (Chronic Fatigue), or Lady Gaga (Fibromalygia), all who still manage to perform for millions and keep their suffering behind the scenes. Our day jobs are as diverse as the interests of humanity, but what we all have in common is our side gig as warriors on the front lines of human immune health. This means the narrative around immunodiverse people needs to change. Us Clark Kents need to be seen, heard, accommodated, and employed. We need to find a healthy way to make space for our humanity at work. We need to find a healthy way to make space for our humanity at work. I have found that what I require is not “more” than what other employees demand, most of the time; it’s just different, and poorly understood. My condition has a name, but truthfully, everyone has special circumstances they bring with them to work and that affect the way they show up. Everyone carries some invisible battle. For me, I’ve found simply by being open about my condition brings a level of awareness to the workplace that is often missing. I become a resource for my coworkers and others around me who need support to develop healthy ways of engaging within the office so they can bring their best selves and bring out the best in others. I learned these skills because I had no choice; I share them freely with anyone who asks, because I believe we all can benefit from understanding our interdependence and creating environments of mutual support. When I am in communities that recognize and support my immunodiversity, we thrive together. Want more ideas to bring to your office? Read Next: Workplace 4.0: Accommodating the Immunodiverse. *In reality, the US government estimates between 10–40% of people you meet in any given day have a disability (depends where you are in the country). Since the ADA passed in 1990 (and we started measuring), the number of people who consider themselves to have a disability has risen and the number of people working with a disability has fallen. We need to change this trend. Liz Travis Allen is a lawyer, public policy strategist, and speaker who applies her unusual combination of experience in service of a more equitable future. She is available to speak at your workplace about diversity and inclusion, invisible disabilities and women’s empowerment. Learn more about her work on her website, on LinkedIn and through the Invisible Stories Project. Thanks to Candace Faber, Sophie Carmel Speer, and Sara McAulay. Storyteller, speaker, lawyer, disabilities rights activist. Catch me over at liztravisallen.com or at the invisiblestoriesproject.com. She/her.